Say goodbye and good riddance to fleas, ticks, mossies and other biting nasties this spring with VetShopAustralia’s sensational 20% off sale on Advantix 12 packs or any 2 x 6 pack combinations. 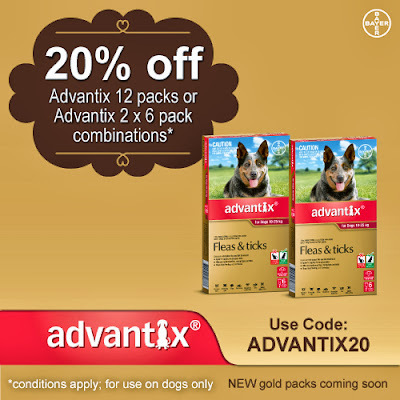 Enter the coupon code below when you purchase any 12 pack or 2 x 6 pack combination at VetShopAustralia to receive 20% off. Take advantage of this sensational sale; and say goodbye to ticks, mossies and other painful parasites now. Offer ends 15th October, 2013.